Theso-called Galaxy 15 zombie satellite that lost contact with ground controllerson Earth in April is still adrift in space, with engineers keeping a close eye onthe wayward satellite as it approaches two other spacecraft this month. The Galaxy15 satellite is currently drifting along a stable andpredictable path, according to its communications satellite fleet operatorIntelsat. The main focus now is preventing Galaxy 15 from interfering withother nearby satellites, including two of Intelsat's own, though no collisionsare expected. "Theoverall goal is to minimize disruption," Steve Good, Intelsat's global directorof customer solutions engineering, told SPACE.com. "It's in all of ourbest interests to minimize any disruption." The companyis preparing several techniques to mitigate potential signal interference asGalaxy 15 is set to fly by two other Intelsat satellites this month: Galaxy 13and Galaxy 14. The 4,171-pound(1,892-kg) Galaxy 15 satellite went rogue on April 5, when it stoppedresponding to controllers on the ground. Yet, whilethe satellite veered from its assigned orbital slot of 133 degrees westlongitude, 36,000 kilometers over the equator, the "zombiesatellite" maintainedan active payload, with its C-band telecommunications still functioning. Interferencefrom Galaxy 15's stuck-on signal is the main concern, since the chance of it actuallycrashing into other satellites is remote to non-existent, Intelsat officialshave said. On Thursday,July 8, Galaxy 15 is expected to begin approaching Galaxy 13, making itsclosest pass on July 13. "Galaxy15 has a very large inclination, and if it stayed there, that would begreat," Good said, referring to the tilt of the satellite's orbit withrespect to Earth's equator. "But, twice a day it crosses the zerolatitude line. At that point in time, that's when the physical distancebetween the two satellites is going to be minimized." Intelsat's Galaxy13 and Galaxy 14 satellites both provide video media services to U.S. customers,and the satellite operator has been in regular contact with users inpreparation for the flybys. "We'relooking at each customer specifically," Good said. "We?re workingwith them and we've offered them options. We've been in talks almostdaily." Galaxy 15will begin entering Galaxy 14's orbit on July 26. It will make its closest passon July 30. 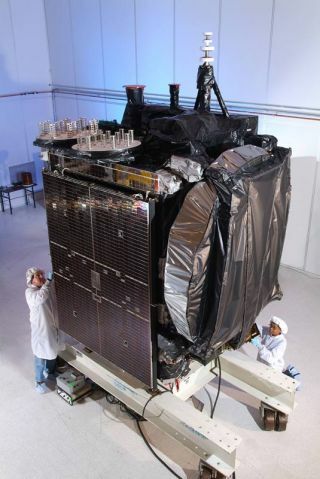 Intelsat engineershave planned a variety of techniques to address interference concerns fromGalaxy 15, including boosting the sensitivity of satellites the zombiesat fliesnear, and moving them if necessary. They are also arranging for some customerswho uplink to Galaxy 13 or 14 services to shift ? or "mispoint" ? theirantennas, depending on the location of the rogue satellite, so they don'treceive its wayward signals. "If youhave a large antenna, for example, you can mispoint to the east, and as soon asGalaxy 15 passes, you then mispoint to the west," Good explained. "It's like you're intentionally avoidingthe Galaxy 15 satellite." In addition,while each case is different, Good and his team can look to their successfulcollaboration with SES as inspiration. In May, thesatellite operator SES World Skies, whose AMC-11 satellite orbited into Galaxy15's cross-hairs, worked with Intelsat to successfully perform a series of intricatemaneuvers in order to avoid interference and service interruptions. "Notall flybys are created equal, but we certainly learned a lot of lessons fromthe first one," he said. Intelsatwill also be able to use this knowledge to tackle similar circumstances in thefuture. The company willnext work closely with Telesat, a satellite services provider headquartered inOttawa, Canada, since Galaxy 15 is expected to swoop near Telesat's Anik F3satellite, following the Galaxy 13 and 14 encounters. Severalattempts to shut down Galaxy 15 have been unsuccessful, leaving the defunct satellite drifting in the cosmos. "Normallywhen an anomaly occurs, the satellite just stops working and we don't have toworry about it," Good said. "Galaxy 15 is still operational, so inthis case, the satellite is still "functioning" in a deterministicstate. But, we know exactly where it is, we know what it's doing, and we know thesettings of the satellite." Galaxy 15 launchedon Oct. 13, 2005 aboard an Ariane rocket. Its manufacturer, Orbital SciencesCorp. of Virginia, has said that an intense solar storm in early April may have caused thebreakdown in communication. Meanwhile,Intelsat has launched an on-going technical investigation, but has yet to reachany definitive conclusions as to the cause of the glitch. Such ananomaly, however, is unprecedented, said Good. "Thisis definitely a unique situation," he said. "There are people whohave worked here for over 40 years who have not seen such a thing." Eventually,Galaxy 15 is expected to lose its Earth-pointing capability. Once this lock onEarth is lost and its solar panels are no longer pointed at the sun, thesatellite's battery power will eventually die. "Whenthe battery power decreases past a certain threshold, the payload will shutoff," Good explained. "It will no longer receive and transmit, and itsbatteries will continue to deplete." Thesatellite could also reach a threshold that causes its onboard computers toreset, said Good, but the possibility of this happening is still unknown. "Thereis a possibility that the onboard computer could reset, but we don't know whatthat probability is," he said. "Still, there is a chance. It wouldalmost be like a "control-alt-delete" on your computer. It wouldbegin sending telemetry again. It would wake up and realize 'What am I doinghere?'" Life's Little Mysteries: How MuchJunk is in Space?